What you do when the boy you love won’t do long distance. When I was a freshman, I knew a girl who was dating a boy that lived on another continent. They dated around four or five years, despite only getting to see each other every six months or so. When the girl graduated this past spring, her boyfriend came over to the States and proposed to her, and now they live happily ever after in the UK. Seriously. I’ve looked at their Facebook pictures more than once and sobbed both happy tears and tears of rage over their glorious fairy-tale life. Out of all the long distance relationships I have ever seen, I have never seen something turn out so perfectly, especially considering that they overcame the Atlantic Ocean. A seemingly normal part of college life, long distance relationships are something that either works or completely crashes and burns. You’ve seen it before, and perhaps you’ve tried one yourself (maybe you’re in one right now and it’s going great!). But clearly, they’re not for everyone. I’ve done it before and I like to think I handled it well — as well as I could for a 20-year-old — and while that relationship is over, I’m currently in another one, although this time it’s a bit different. I met Luke during my first year of undergrad in a performance studies class. We became friends quickly and spent a lot of time together. We fell in love, but it came with a setback: Luke had a girlfriend six hours away in New York, where he was from. Their relationship was quite the mess, and it didn’t completely dissolve until the end of the school year. That seemed easy enough: they break up, Etta James’ “At Last” plays and Luke and I can get to dating. Simple as that, right? Of course not. Shortly after they broke up, Luke told me he got accepted to a school back in New York that had a better focus on the major he dreamed of pursuing. As much as hearing this stopped Etta James dead in her tracks, I couldn’t stop Luke from following his dreams. And after his disastrous experience with long distance dating the girl from back home, he told me he couldn’t do it again — not for awhile, at least. He didn’t want to commit to something he might not have the time for, especially with all of the work he would soon be doing once he transferred. As painful as it was, I got over it. I saw other people. The years moved on. It has now been five years since I met Luke, and, well, I’m still crazy about him. We lost touch for a year or two following his transfer, but we occasionally caught up with one another, sporadically Skyping every couple of months. Ask me this while I’ve been drinking Jack & Cokes, and you’ll hear an extended rant about my situation with Luke. The question is: After five years, why am I still waiting? I wish I could answer simply, but trying to explain our relationship is difficult to word. So if Luke won’t consider a long distance relationship until he’s out of school, where does that leave me? The easy answer is I can call him and say hi now and then; I can text him every day all day, or I can launch Skype and fiddle around with a bad connection for hours. Of course, all of the technology today is great for long distance relationships. There’s so many ways you can stay connected and see each other’s faces no matter where you are. You can essentially be in communication with friends at every moment of every single day. Hats off to Twitter, Facebook, Instagram, Snapchat, Skype/FaceTime, texting and just phones in general for being so wonderful to so many of the long-distancers all the time. Despite all of these wonderful technologies, I resort to something different. Sure, I call every Tuesday after a grueling three-hour night class, and Luke and I text one another when we have the time, but the main way I handle everything? I write him letters and send postcards. Do you remember letters? Those things from the past? Do you remember the joy of getting a letter (not bills) in the mail?\ Despite the fact that people don’t write letters as much as they used to, I still find such joy in holding a letter that’s addressed to me. Here is something that feels so personal, so real, so important and you can’t wait to rip it open and read through it over and over again. Seeing as I write all the time for my major, I thought “Why not?” and started writing letters to Luke around three times a week. 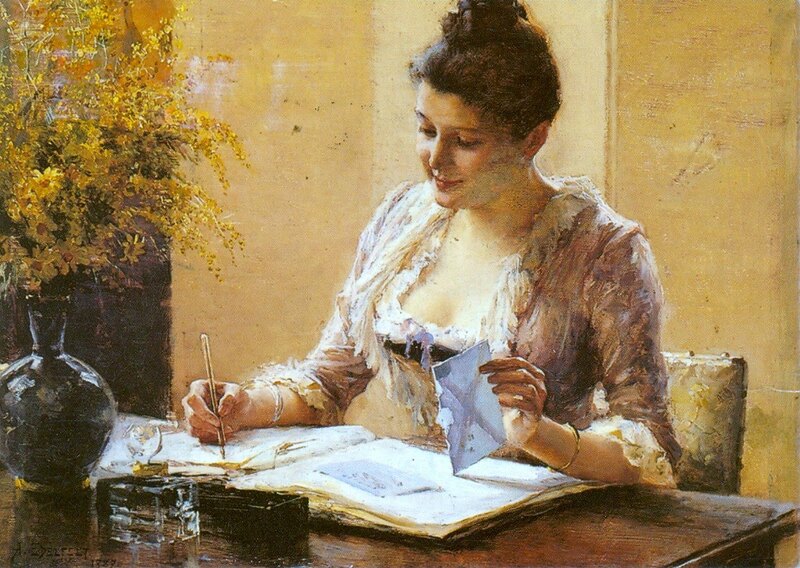 The letters I write are not the kind of letters Victorian era women would write, staring with “Dearest so-and-so” and detailing my day with mellifluous, romantic language. Nah, I’m not that great. I actually don’t start at any one place. I write down fragments of my thoughts about anything and everything. I recall small memories from my past (in one letter I talked about how when taking attendance, my 3rd grade teacher would call everyone by first and last name except for me. I was always just “Olivia”); I’ll ask him spur of the moment questions (“Do you ever wake up from a dream wanting to throw your brother out a window?”); I’ll talk about why I love going to operas and ballets—and can we go sometime, please? There is no order to my letter method. I just write. It’s as refreshing as a normal conversation. Writing all of your thoughts and worries down on a page or two can really leave you feeling like a new person. But that’s not all you can do here—you can draw on that letter! You can add some color to that letter! You can write that kid a poem! You can do all kinds of great stuff in that letter. I have actually sent Luke made-up surveys before, which he has filled out and mailed back to me. A couple of days later, I usually receive a Snapchat from Luke of the letter. He’s told me more than once over the phone that he loves getting mail from me and tells me to not stop sending them. If I find I don’t have too much to say or just don’t have the time, I usually substitute a card instead. Cards work just as well, and usually brighten his day after spending hours trudging through thesis work. So if you find you can’t take on a letter, send that kid a card! While a phone call is still something I consider to be very sweet, letters are much more endearing. Here’s something that someone wrote out and took the time to do—just for you! Of course, you don’t get to hear their voice or see them on a screen, but seeing their handwriting has a wonderfully romantic appeal to it. It’s an old-timey idea, but you’d be surprised how it can work wonders.